Qatar Airways Holidays (QRH) is delighted to launch its social media competition ‘Match and Win,’ from 9 October to 16 October 2016. The contest requires participants to log into Qatar Airways Holidays Facebook page on facebook.com/qatarairwaysholidays and answer 10 questions by choosing the matching destination image for a chance to win a holiday package, an ipad mini and Qatar Duty Free vouchers. 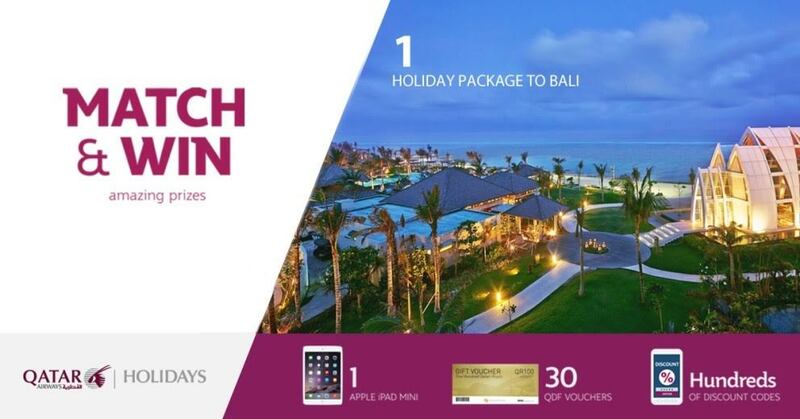 Participants who successfully answer all 10 questions will be entered into a draw to win an exciting holiday package to Bali inclusive of one Qatar Airways Economy Class return airfare and four nights stay at the Ritz-Carlton Bali. In addition, one lucky winner will get an ipad mini and 30 winners will receive vouchers worth 100 QAR to spend at Qatar Duty Free when travelling via Hamad International Airport. Qatar Airways Holidays is the leisure travel division of Qatar Airways. It offers a diverse range of full-service holiday packages for all types of traveller that demand a seamless and hassle-free travel experience. Travellers planning holidays can choose flights and accommodation, book transfers, insurance, car rental and destination activities all with Qatar Airways Holidays from Qatar, the UAE, Bahrain, Kuwait, Saudi Arabia and Oman to more than 150 of Qatar Airways destinations worldwide and beyond to over 1,500 tourism global destinations. Travellers willing to stopover in Doha can also book their hotels and tours online with Discover Qatar on discoverqatar.qatarairways.com.